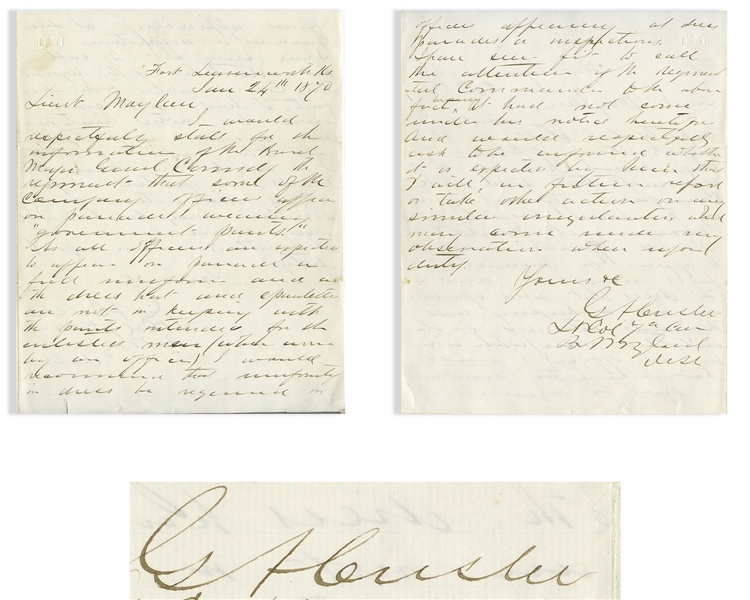 Very rare autograph letter signed by George Armstrong Custer as Lt. Colonel of the 7th Cavalry, regarding the effect of uniforms on troop morale and discipline. 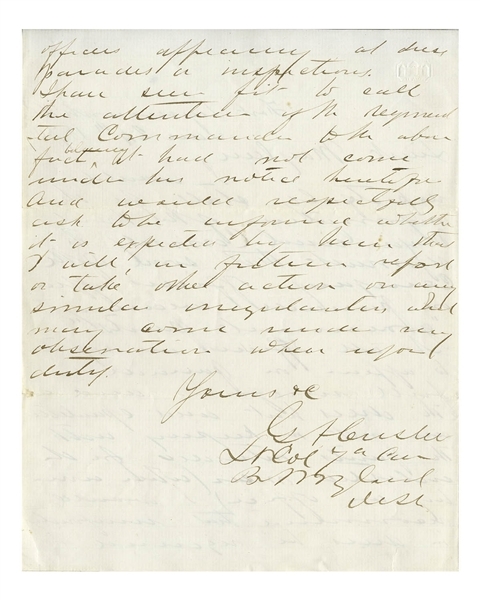 From Fort Leavenworth, Kansas on 24 January 1870, Custer writes to Lieutenant Moylan, in full, ''I would respectfully state for the information of the Brevet Major General Comdg the regiment that some of the company officers appear on parade wearing 'government pants!' As all officers are expected to appear on parade in full uniform and as the dress hat and epaulettes are not in keeping with the pants intended for the enlisted men (when worn by an officer) I would recommend that uniformity in dress be required in officers appearing at dress parades or inspections. I have seen fit to call the attention of the regimental commander to the above fact believing it had not come under his notice heretofore. And would respectfully ask to be informed whether it is expected by him that I will, in future, report or take other action on any similar irregularities which may come under my observation when upon duty. / Yours &c. / GA Custer / Lt Col 7th Cav / Br Maj Gnl / USA''. 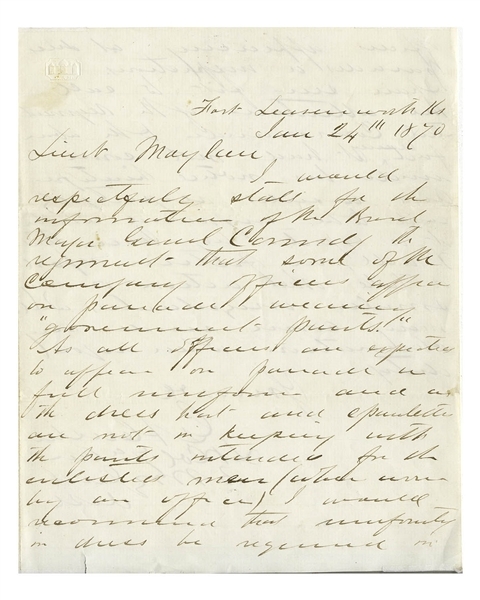 Letter is docketed on last page, ''Custer George A. / Brevet Maj. Genl U.S.A. / Calls attention to non-uniformity of the clothing worn by Company Officers on occasions of parade & ceremony''. 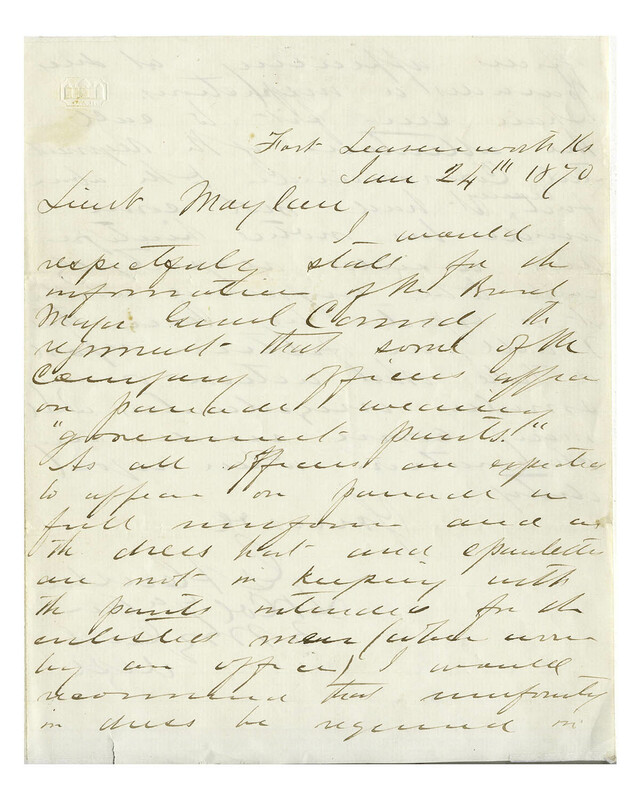 The addressee of the letter, Medal of Honor recipient Myles Moylan, was present with Custer at Little Bighorn, and married the sister of Custer's brother-in-law, Lottie Calhoun. 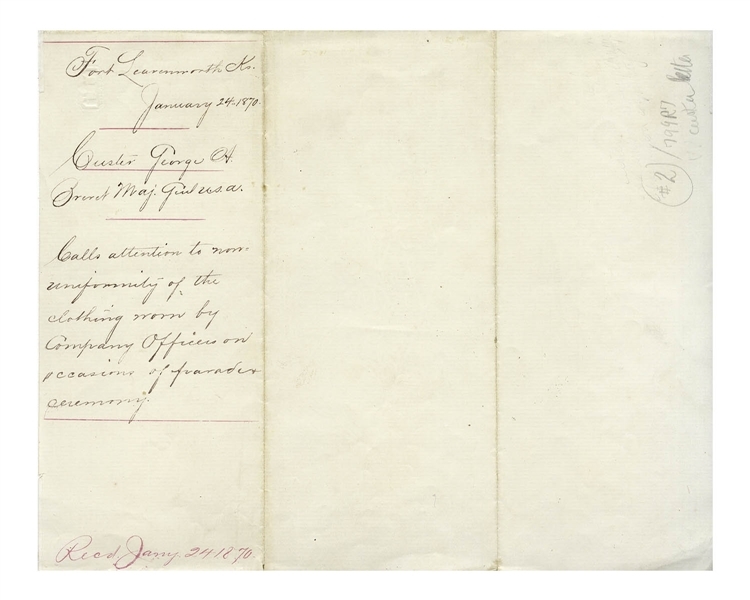 Two page letter on card-style stationery measures 7.75'' x 9.75'', in Custer's distinctive handwriting. Light wear, overall in very good to near fine condition.